Charles Adams, Emeritus Professor of Islamic Studies at McGill and for nearly 20 years the Director of the Institute of Islamic Studies there, died March 23 in Mesa, Arizona. A brief obituary can be found here. For further information regarding Professor Adams' career at McGill, an article from the May 29, 1997 McGill Reporter is available here. A biography by B. Todd Lawson can be found in Islamic Studies Presented to Charles J. Adams, ed. Wael B. Hallaq and Donald P. Little, (E.J. Brill, 1991). It is with great sadness that I learned yesterday that Charles J. Adams died in Mesa, Arizona on March 23 of this year. During his final years he lived in retirement in Arizona, suffering from the steady deteriorating effects of Parkinson’s Disease, which affected his body but not his clear, sharp mind. I had the good fortune to be able to visit Charles three weeks before his demise in his retirement village in Mesa, Arizona, where he lived with a friend and companion who looked after him in recent years. We had lunch together and got out books and reminisced about the evolution of the field of Islamic Studies during our lifetime, over which he had exerted such great influence through his many student and writings. He nonetheless felt sad and helpless that in his declining state of health he was powerless to any longer be a voice in the academic study of religion in the current climate of suspicion, fear and hate about Islam in the public sphere. Charles was born in Houston, Texas in 1924. His undergraduate education was at Baylor University, which was interrupted when he volunteered to serve in the Air Force during World War II as an airborne radio operator and mechanic. After the war he returned to Balyor to earn the B.A. In 1947 he entered graduate school at the University of Chicago, to study history of Religions with Joachim Wach. He later wrote a dissertation on “Nathan Söderblom As an Historian of Religion.” His long career at McGill University began when he joined the faculty in 1952. Adams the historian of religion turned his head more particularly toward Islam when, under a Ford Foundation Grant, he studied Islam in Pakistan. He returned to McGill to join the new Institute of Islamic Studies, and later served as its director from 1964 to 1980. It was there that he had his greatest influence as teacher and mentor for thirty-six years to students from across North America and indeed the world, many of them Muslims. Charles expressed to me the wish that he had published more during his active years, but what he had published was essential reading to scholars in the latter half of the twentieth century, before the academy in North America took much interest in the Islamic religion. As teacher, scholar, writer and warm colleague, Charles Adams will be remembered as a lucid writer, thinker and lecturer who could synthesize vast amounts of technical information into orderly, understandable prose. A fuller biography by Todd Larson can be found in Islamic Studies Presented to Charles J. Adams, ed. Wael B. Hallaq and Donald P. Little, (E.J. Brill, 1991). In 1963, Charles Adams was appointed Director of McGill's Institute of Islamic Studies and he held that post for almost 20 years. His association with the institute, however, began more than a decade earlier when he came to study at the newly founded institute in 1952. He left to teach for a year at Princeton and came back to McGill when he was awarded a three-year Ford Foundation Foreign Training and Research Scholarship. He spent part of that time in Pakistan, returning to McGill in 1954. A native of Houston, Texas, Adams received a BA from Baylor University in Waco, although his education was interrupted by a stint as an airborne radio operator in World War Two. He went on to the University of Chicago Divinity School, where his studies were again interrupted when he was called up to serve briefly during the Korean War. He was awarded a PhD in the History of Religions from the University of Chicago in 1955. 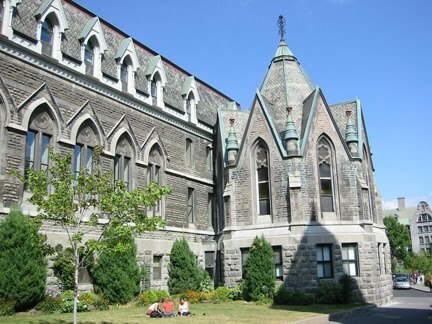 He became a McGill faculty member in 1960, and throughout his teaching career, Adams refused to delegate responsibility for introductory courses to teaching assistants. Said a colleague in a tribute to Adams on his 65th birthday, "His teaching, masterful never arrogant, summoned the inherent dignity of both Islam and the student to meet in the classroom. The inevitable mutual respect generated optimum conditions for learning." As a writer on Islamic culture and religion, he contributed numerous articles to the Encyclopedia Britannica, the World Book Encyclopedia and Encyclopedia Americana, as well as many book chapters. He edited A Reader's Guide to the Great Religions, which became an important text for teachers and students of religion. He also served for many years as editor of the Religious Studies Review.